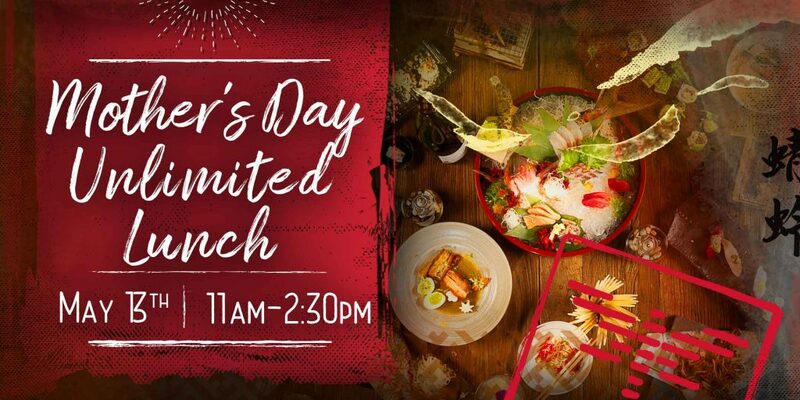 Join us Sunday, from 11:00 am to 2:30 pm on May 13th to celebrate Mother’s Day in Orlando with our special Mother’s Day unlimited Izakaya lunch! Better than a buffet, we’ll be preparing a variety of classic Izakaya dishes made to order and delivered right to your table. In addition to the bottomless kitchen favorites, we’ll have live action stations set-up in the dining room where you can request personalized makisushi, nigiri, and poké bowls. Our first seating is at 11:00 am, and last seating will be at 2:30 pm. Lunch is only $39.00 per person for adults and $19 per person for children ages 5-12. Kids 5 and under eat free. We’ll even offer a $15 Bottomless adult beverage option to really get mom’s celebration flowing! To secure your space for our Mother’s Day in Orlando celebration, simply make a reservation on our website by clicking here, or call us at(407) 370.3359. Let’s celebrate! > How can I make a reservation for this Unlimited Lunch for Mother’s Day in Orlando? Call us direct at (305) 222.7447, or click here to make your reservation on our website. > What are the selections for the bottomless Adult Beverage? With this option, you can choose from the following: Bloody Hot Haraguchi, Mimosa, Bellini. > Does the ticket cost include beverages, tax, and tip? The advertised price does not include tax, tip, or beverages. > Will allergen or dietary restrictions be accommodated? We will do our best to accommodate anyone with dietary restrictions or allergies, but this lunch event menu is preset. If you have specific questions or concerns about your dietary needs, please contact us at (407) 370.3359. We will be happy to discuss the options with you. > What are my transportation/parking options for getting to and from the event? We have free garage and lot parking available on-site. > How can I contact the organizer with any questions? Easy, give us a call at(407) 370.3359, or reach out to us via email: robata@dragonflyrestaurants.com. * Menu is subject to change up to the event day.